“Be yourself.Free yourself.”-- Graham Nash (1971)“There will be times when the words don’t come.Your own voice, once huge, now smallerwhen the teacher asks What did you do last summer?We went to France, Chayla says.These shells came from a beach in Maine.A boy named Jonathan holds out a jarfilled with tiny shells so fragile,they look like they’ll turn to dustin your own untraveled hands.My whole family went to India.Spain!South Carolina!Each souvenir a small triumphof a journey.Their travels going on and on.And as you stand in front of that room, you can only rememberhow the heat wavedas it lifted off the curb,and your days spent at homecaring for your little sister,who made you laugh out loud and hugged you hardat naptime. You can only remember the books you kept on readinglong after she had fallento sleep.And in that room, where no one else is quite like you, you’ll look downat your own empty hands and wonder What good is this when other students were flyingand sailing andgoing somewhere.”It’s easy to focus on our differences, whether they relate to race, class, gender, religion, ethnicity, clothing, body size and shape, hair color and texture, how many generations our families have been in America, or how many parents of what sexes are at home. The alternative to obsessing about our differences is to shine a light on our similarities and connections. THE DAY YOU BEGIN is about feeling different, fearing the differences, but finding one’s own voice. By speaking our truths, we become part of the chorus of humanity..In the classroom where the story is set, students laugh at an immigrant classmate for his language differences. They turn up their noses at an Asian meal that another classmate has brought for lunch. And they exclude another classmate from a game at recess because of his ability differences.It’s not surprising that Angelina, the girl who didn’t get to travel anywhere and spent the summer taking care of her little sister, fears speaking up in front of the class. But, as she learns, “There will be times when you walk into a room and no one there is quite like you until the day you being to share your stories.”The hurt of being laughed at, scorned, or excluded can stay with us, no matter how well things go for us in the long run. Many of us have vivid memories of being treated in such a manner even when, as in my case, we recall incidents that took place half a century ago.There are plenty of books for young people of various ages in which characters deal with such conflicts. Some feature animal characters. But it is rare to encounter a book like this, one that tackles these issues head-on. 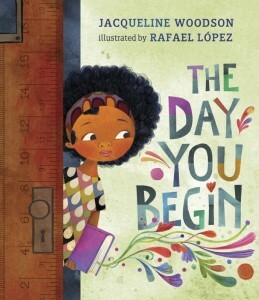 That’s why THE DAY YOU BEGIN is such an important picture book, one that could make a real difference in a child’s life, and a perfect choice for a first-day-of-school read. I hope that THE DAY YOU BEGIN encourages children to speak up and share their stories. But I also hope that it encourages empathic young people to stand up for their belittled peers. When people stand up for others, a community gets stronger. I still wonder why a certain popular, athletic, junior high classmate of mine befriended and included me despite our differences. He doesn’t know it, but he’s always been a hero to me.Rafael López’s illustrations soar! They’re a combination of acrylic paint on wood, pen and ink, and watercolors combined digitally in Photoshop. Incorporated into the illustrations of a doorway. a tree, and a lunchroom table are a measuring ruler. How, we often wonder, do we measure up?THE DAY YOU BEGIN gave me joy to read and to look at. I encourage you to share that joy.